The Chiang Mai Tourism Promotion Board (CTPB) held the Chiang Mai and North Travel Show 2004 from November 29 - December 2 in an effort to stimulate the growth of the local tourism industry. Over 264 agents participated in the show. Of these, 194 were from overseas, especially from Scandinavian countries, and Australia, New Zealand and Russia. “As tourism has been the main source of income for Chiang Mai in the last four years, the 2004 travel show will play a significant role in further strengthening Chiang Mai as a tourist city and promoting its tourism growth,” said Chiang Mai Mayor Boonlert Buranuprakorn, who is also chairman of the CTPB. The event helped in providing a forum for Chiang Mai agents to meet with foreign and Thai buyers. Chiang Mai Municipality and Chiang Mai Provincial Administration Organization (PAO) contributed 500,000 baht and 1.5 million baht to the event respectively. The health and spa industry, MICE and golf tours that have been expanding in Chiang Mai were new alternatives for buyers at the event. “The PAO plans to earmark five percent of its budget to support tourism and cultural activities of Chiang Mai to sustain the growth,” said Chatri Limchamroon, the PAO Council chairman. “The PAO realizes the importance of the tourism industry and has supported the tourism-related entrepreneurs by taxing them only 0.8 percent while some tourist cities like Phuket collect three percent,” he said. It was expected that the event would bring in approximately 75 billion baht, according to Vorapong Moochaotai, president of the Thai Hotel Association, Northern Chapter. The Thai Government wants to make Thailand the center of Indo-China’s logistics by the year 2008, according to Suebsak Dangboonrueng, deputy director of the One Stop Export Service in the Department of Export Promotion of the Commerce Ministry. Suebsak Dangboonrueng (left), deputy director of the One Stop Export Service, and Jiraporn Tulayanont (right), director of the Export Promotion Office, Northern Region. The government has assigned the One Stop Export Service to be responsible in applying a five year plan for the country’s logistics development to reach the 2008 goal. The plan covers measures to raise people’s awareness of logistics, adding logistics study to the school curriculum nationwide, and educating executives and the public about logistics. The plan focuses on four main development directions - information systems, information networks, infrastructure development and personnel development. At present, the Ministry of Transport has improved the whole transportation system of Thailand trying to link all transportation methods to ease the logistics growth, especially within the Quadrangle Economic Development Cooperation area. The Ministry of Information and Communication Technology (ICT) is now responsible for the information network and the National Statistics Office, Ministry of Technology and Communication is responsible for the information system development. “Personnel is the weak point in Thailand’s growth, as manpower is inadequate and most Thais’ foreign language skills are poor,” Suebsak said. The Minister of Commerce is working on developing the quality of personnel in the logistics field to support the government’s target. “However, the budget of 157 million baht earmarked for the operation is inadequate and a larger budget is needed before the plan is submitted to the cabinet,” he said. Thai exporters should keep the quality of their products in line with the Australian government’s requirements after the Australia-Thai Free Trade Agreement (FTA) is activated on January 1, according to an Australian business and law academic. Roberto Bergani, from the Faculty of Business and Law, Victoria University of Technology, Australia. Roberto Bergani, a lecturer of the Faculty of Business and Law at Victoria University of Technology, said this in a lecture on “Logistics and Supply Chain for Thai Exporters” at Novotel, Chiang Mai on November 26. “Fruit and vegetables are two categories that the Australian government examine strictly, and quarantine is another important matter that Thai exporters have to consider carefully,” Bergani said. His lecture was aimed to inform Thai exporters about Australian customs regulations in preparation for the FTA. According to Bergani, under the Australia-Thai FTA, the customs processes would be substantially the same in both countries. “As Thai and Australian farms bear fruits in different seasons, both countries could take turns to export their fruits, which will benefit both countries,” said Bergani. Main Thai exports to Australia are fruit, vegetables, wooden products and ceramics, while Australian exports are pharmaceutical, technical and dairy products. Wine was another product which Australia had looked at, but the Thai market was too small. Recently, entrepreneurs from Sydney viewed Thai decorations but commented these were more expensive than those from China, said Jiraporn Tulayanont, director of the Export Promotion Office, Northern Region. “Thai products have to be upgraded to have better quality and design than Chinese products or suffer losing out to China,” he said. The Highways Department has employed four companies to do economic, engineering and environmental impact studies on the proposed construction of a new highway to Mae Hong Son through Samoeng district, Chiang Mai, and tambon Huay Pu Ling, Mae Hong Son. With this short cut, the distance between Mae Hong Son and Chiang Mai would be reduced to 192 kilometers. According to the survey, most local people in Samoeng district, Chiang Mai and Huay Pu Ling village in Mae Hong Son want the highway to be constructed. It is predicted that the short cut will not only ease traveling for Mae Hong Son people going to Chiang Mai, it will also bring more investment to the area. Gasidit Watanasup, director of Mae Hong Son Provincial Highways District Office, said that the Samoeng-Huay Pu Ling route was not a new one, as it has been used by local people for a long time. However, the road is unpaved, less than four meters wide and is sloped due to the topographical features. With the new plan, the width of the road will be expanded to 11 meters. However, the construction still depends on the environmental impact study being conducted by the Natural Resource and Environment Department. All studies will be in by February next year. If all approve, the highway plan will be proposed to the cabinet for approval. The Local Administration Promotion Department, National Economic and Social Development Assembly has earmarked 20 million baht for the Mae Sai District Municipality to construct a new border market in front of the district police station in Chiang Rai. An engineering team from Chiang Mai University’s Faculty of Architecture has been commissioned to study the structure of the proposed border market, with the architecture being in Lanna style. Part of the budget has been spent on landscaping in front of the Mae Sai district police station. “The new market will distribute Chiang Rai OTOP (One Tambon One Product) goods, and house a tourist information center,” said Mae Sai mayor, Dr Wichai Taweepworadech. “According to the working group, a survey on October 29 showed that local people approved the project,” said Dr Wichai. The working group is confident that the market would increase tourism activity and trade in Mae Sai district. The working committee has considered constructing an underpass on the Paholyothin Road for pedestrians visiting the market. The Faculty of Agriculture at Chiang Mai University hosted an International Farmers’ Dialogue at Chiang Mai University to provide several countries the opportunity to discuss and exchange knowledge. Participants from around the world discuss organic farming methods. Participants came from England, the United States, France, Canada, India, Cambodia, Poland, Australia, Laos, countries in Africa, Japan and host nation Thailand for the five day November seminar held in cooperation with the National Science and Technology Development Agency (NSTD). “This international conference will be very beneficial for all in building networks to promote sustainable agricultural development in this age of globalization,” Assoc Prof Dr Daoroong Kangwarnpong, CMU’s deputy president of Research, said at the opening. “Organic foods are in high demand around the world ... All farming needs development in organic methods, and to be concerned with quality,” said Dr Sumeth Tantiwechkul, secretary of the Chaipattana Foundation. In response to this increasing demand for organic foods, the conference emphasis was on organic farming, and participants were given a chance to increase their understanding and knowledge of organic crops. They were taken on a field tour to observe Thai farming in many locations to see new methods and exchange techniques and experiences. This year’s nine-day Loy Krathong festival will bring in 900 million baht for Chiang Mai, according to Junnapong Saranark, Tourism Authority of Thailand, Northern Region 1 director. 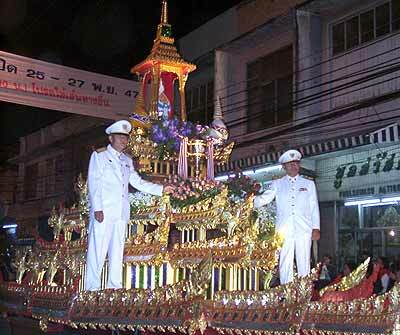 Previous festivals added about 500-800 million baht to the city’s economy, said Junnapong. The number of domestic tourists was equivalent to foreign tourists and the statistics showed that the number of Loy Krathong visitors has increased each year. Hotel advance bookings for the festival reached 80 percent and the number of foreign tourists also increased from previous years, according to Vorapong Moochaotai, president of the Thai Hotel Association, Northern Chapter. The Astronomical Education Center of the Northern Region at the Sirindhorn Observatory, Chiang Mai University, which was officially opened by Her Royal Highness Princess Sirindhorn on November 22, will help promote the study of astronomy. This is the view of Assoc Prof Boonraksa Soonthornthum, the university’s Dean of the Faculty of Science. A reflecting telescope 0.45-0.5 meters in diameter at the center would raise students’ interest and enhance teaching of astronomy throughout the North as pictures of planets and space taken by the telescope could be sent to schools using the Internet, he said. About 10,000 people visit the Sirindhorn Observatory each year. Training for astronomy teachers and lecturers is another activity taking place at the center to stimulate the development of astronomy teaching. However, Assoc Prof Boonraksa said that the Thai government’s support for astronomy research was meager and research equipment inadequate compared to other countries. The government hopes to interest students in astronomy through the activities of the Ministry of Education’s Institute for the Promotion of Teaching Science and Technology. “Vague career direction for astronomy graduates partly has caused astronomy studies to be unpopular among Thai students,” said Assoc Prof Boonraksa. 80 officials from Chiang Mai and Chiang Rai, including district chief officers, superintendents, customs and immigration officials, and narcotics suppression police met to discuss border problems. The meeting, held at the Pha Muang Task Force on November 25, included discussion on drug trafficking, problems associated with the issuing of alien laborer ID cards and the illegal entry of alien laborers. Commander of Pha Muang Task Force, Maj Gen Manus Paorik, said participants were informed of the Pha Muang Task Force’s border mission. The task force urged relevant organizations to supply the names of illegal alien laborers or migrants who had to be repatriated. Although new armed troops to control minority tribes were positioned along the border area to replace ousted Burmese prime minister, General Khin Nyunt’s troops, there was still no sign of violence or operational obstacles from the new troops, Maj Gen Manus said. The task force prepared five more refugee camps for Burmese refugees in case fighting between the Burmese regime and the minority army took place, he said. Four of the camps are at Wiang Haeng, Ang Khang, Arunothai and Sanchoon in Chiang Mai and the fifth at Mae Fa Luang district in Chiang Rai. Maj Gen Manus urged police to regularly set up checkpoints to block drug smuggling, as he noticed that many drugs were being confiscated daily. “Soldiers have been deployed to patrol border areas but drugs are still entering the country,” he said. Roads and highways are outside the jurisdiction of the task force and soldiers, so police should strictly check all passing vehicles. Maj Gen Paorik said he asked the new Burmese government representative to keep a watch on the Red Wa group as he believes the tribe is unreliable. The Burmese officials promised to do so. “But the new Burmese government is concentrating on combating the minority army, while other matters are of less importance to it,” he said. The International Peace Foundation, which hosts the event series “Bridges - Dialogues Towards a Culture of Peace” that began in November 2003 in Thailand, has announced the second series, which will run from December 2004 to April 2005. In this series of more than 200 lectures and dialogues, seminars, workshops and artistic performances they hope to establish creative conflict resolution programs for the growing threats of war and international terrorism. They are involving 28 Nobel Laureates as well as decision makers in international politics, economy, science, and culture, and Thai leaders. Thursday, December 9 at 10.30 a.m., keynote speech and dialogue at Chiang Mai University. The Economics of Peace by Prof. Clive W. Granger, Nobel Laureate for Economics. He is a Professor of Economics at the University of California in St. Diego. He was awarded the 2003 Nobel Prize in Economic Sciences, shared with Prof. Robert F. Eagle for the development of methods of analyzing economic time series with common trends. Wednesday, December 15, 2 p.m. keynote speech and dialogue at Chiang Mai University ‘Structures of the molecules of life – Impact on modern biomedical research’ by Prof. Kurt Wthrich, Nobel Laureate for Chemistry, Zurich. Kurt Wthrich received the 2002 Nobel Prize for Chemistry. Tuesday, January 4, 2005, 9:30 a.m. Public dialogue at Mae Fah Luang University, Chiang Rai, and on Wednesday, January 5, 2005, 9:30 a.m. Public dialogue at Chiang Mai University. These are with Prof. Jean-Marie Lehn, who was awarded the Nobel Prize for Chemistry in 1987. Thursday, January 27, 2005, 2 p.m. keynote speech and dialogue at Payap University Chiang Mai. ‘Education for peace’ by Bishop Carlos F.X. Belo, Nobel Peace Laureate, who is a patron of the International Peace Foundation, who received the 1996 Nobel Peace Prize for his work towards a just and peaceful solution to the conflict in East Timor. 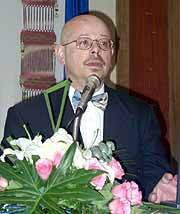 Wednesday, February 9, 2005, 2 p.m. keynote speech and dialogue at Chiang Mai University. ‘Peace and disarmament – Prospect after Iraq’ by Dr. Hans Blix, former head of the UN weapons of mass destruction inspections in Iraq. 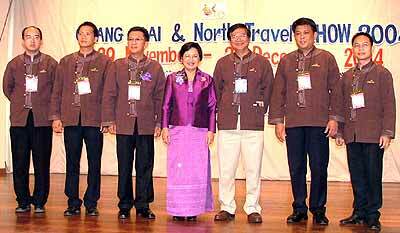 Thursday, February 24, 2005, 2 p.m. keynote speech and dialogue at Chiang Mai University. ‘The challenge of reconciling biological and cultural imperatives in the quest for peace and sustainability’ by Prof. Peter C. Doherty, Nobel Laureate for Medicine. 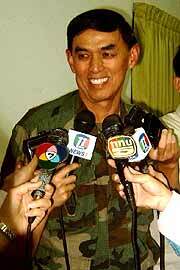 Wednesday, March 2, 2005, 2 p.m. keynote speech and dialogue at Chiang Mai University. ‘Beliefs, institutions and the control of violence’ by Prof. Douglass C. North, awarded the 1993 Nobel Prize for Economic Sciences. 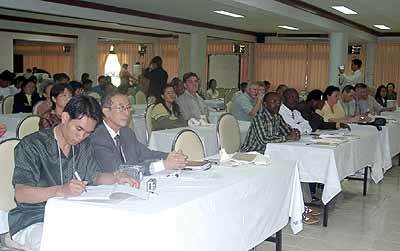 Wednesday, March 16, 2005, 2 p.m. keynote speech and dialogue at Chiang Mai University. ‘Science and the protection of human rights’ by Prof. Peter Agre, who was awarded the 2003 Nobel Prize for Chemistry. The Senate Committee for Buddhism, Art and Culture Study has met to hear arguments about the use of Buddhist art and architecture at the Dara Dhevi and Ratchamankla hotels. “At the meeting, held at Wat Suan Dok, Chiang Mai on November 29, the committee listened to both sides to decide whether the decorations and building should be allowed or not,” said Dr Penchan Jaksujinda, its deputy chairman. Dr Penchan Jaksujinda (woman in the middle), deputy chairman of the Committee for Buddhism, Art and Culture Study, Chatchawarn Panusdith (4th left, wearing spectacles), advisor to the Committee for Buddhism, Art and Culture Study and other committee members at the meeting to study the information. According to Dr Penchan, the committee will send the result of the hearing to the House Commissioner for Buddhism, Art and Culture Study for adjudication. If the decorations at these hotels are deemed inappropriate, a resolution will be passed and sent to the associated ministry for the hotels to remove them. The opposition group, led by Phra Maha Dr Boonchuay Sirindharo, an abbot of Wat Lai Hin Luang in Lampang, and academics from the Social Research Institute called for a minor amendment to the law in the Thai Constitution on Buddhism Protection to be passed to clarify the situation. The group also wants the government to reorganize the status of Buddhism and promote real knowledge and understanding of it among Thai people to create greater awareness. Copyright law for temples was the perfect way out for this problem to prevent other hotels or entertainment outlets reproducing any Buddhist architecture, suggested Dr Penchan. “Architects should have a real understanding of Buddhism as well, in order to prevent the use of Buddhist art in inappropriate contexts,” suggested Chatchawarn Panusdith, advisor to the Committee for Buddhism, Art and Culture Study. The ethics of architects should be promoted and they should take part in drafting the minor law to protect Buddhism and monks. Concern about international relations with Laos and Myanmar was brought up at the meeting by one of the participants, who claimed religious places in Luang Prabang and Mandalay Palace were also reproduced at the Mandarin Dara Dhevi Hotel. “The Ancient City in Samutprakarn was a good example of reproducing Buddhist art and architecture in appropriate ways acceptable to Buddhists,” Dr Penchan said. She added, “Buddhist reproduction and decorations at hotels and entertainment venues are considered contrary to the real teaching of Buddhism and not in keep with their environment, although the owners claim they intended to conserve and promote the culture.” However, the hotel personnel insisted their intention was to conserve Lanna architecture and promote tourism without meaning to insult or denigrate Buddhist art and culture. The Pha Muang Task Force operating along the Myanmar border arrested two drug dealers and killed another at Mae Fa Luang district of Chiang Rai and Chiang Mai’s Chiang Dao district. Under the command of Maj Gen Manus Paorik of the Pha Muang Task Force, five teams of the 3rd Cavalry Special Task Force soldiers, 138th Cavalry Battalion were on patrol along the Mae Joke-Terd Thai route in Mae Fa Laung district, about 500 meters from the border on November 25. They came across two Burmese and apprehended one of them. He was in possession of drug-taking equipment and a firearm. The next day, the team patrolled at Ban Pang Ma Hun in Mae Fa Luang district, about 2.5 km from the border, and searched a hut in which two suspects were staying. The two fired at the oncoming soldiers, who returned fire. At the end of the gunfight, the soldiers found one of them had been killed while the other had managed to escape. They confiscated 1,600 ya ba tablets, 6 rolls of heroin, 1 kg of crude opium, a 9mm pistol, 24 rounds of ammunition and drug-taking equipment. Medical staff from Mae Fa Laung Hospital ascertained that the suspect, whose nationality could not be established, was deceased. On November 27, soldiers from the 2nd Cavalry Department of the 127th Cavalry Battalion searched Ban Nasiri in Maung Na of Chiang Dao District, Chiang Mai and arrested a Lahu man, Jaba Jalae. They seized an AK-47 and 30 rounds of ammunition, a shotgun and a grenade. Jaba was taken to Na Wai district police station in Chiang Dao for questioning. 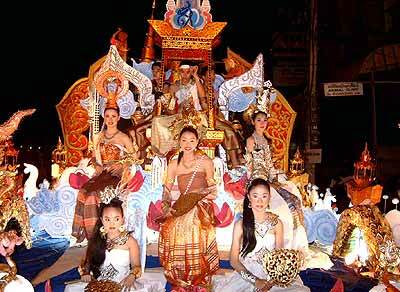 The float with the trophy for the most beautiful large-sized krathong in the procession on November 26. 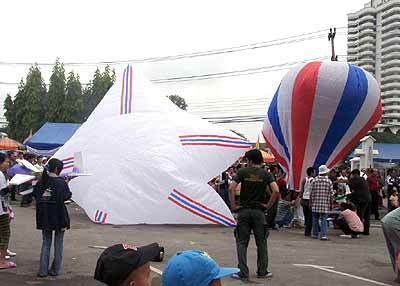 One of the large krathongs in the competition held on November 26 in Chiang Mai as part of the 9 day Yi Peng Festival. The US Consulate’s Loy Krathong festivities were one of the highlights of the year. Despite traffic jams and the unusual rain, there was nothing which could keep the community away on Friday, November 26. The attractions, Lanna delicacies, Lanna sports competitions, Lanna-style entertainment and do-it-yourself krathong making were all part of the entertainment. 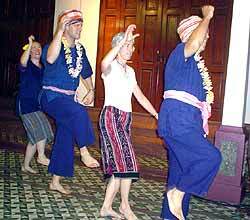 The Isaan dance show, featuring consulate staff and spouses. Bea Camp and David Summers, and Maggie Flynn and Scott Hansen (the couple on the left). The US consulate invited members of the local guard force, the police special action department, local police and the Air Force Detachment (415) to take part in the sports competition, and despite the huge effort put forth by the US citizens, the mini-soccer, takraw and even the ping-pong competition was won by the Thai guests. 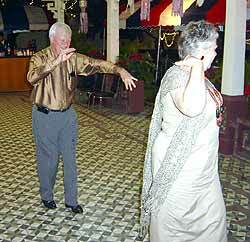 American Ambassador Darryl and Mrs. Johnson doing a Loy Krathong dance at the party. But the best part of the evening was the ‘rice container dance’ from Thailand’s Isaan region, performed by 20 dancers coached by ‘Ajarn’ Supranee. The well balanced performance enchanted all partygoers. The night ended with floating krathongs on the river, more food, more dance and the promise to be back next year for another full moon night on the banks of the River Ping.